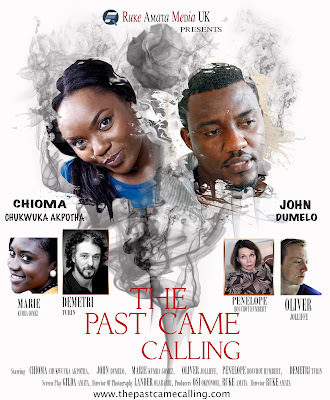 Nollywood Movie Director and seasoned producer, Ruke Amata, has returned to the Nollywood sphere with a new movie, an intriguing story of love, suspense, bitterness and betrayal, The Past Came Calling. The new flick, which features some of the best hands in Nigeria and Ghana movie industry like John Dumelo and Chioma Chukwuka-Apotha, addresses the issues of advanced free fraud (419), inter-racial relationship, juvenile delinquency and the effects of divorce on a child among others. Other members of the cast are Marie Kumba Gomez, Oliver Jolliffe, Demetri Turin, Penelope Humbert and others. The movie which had had a successful premiere and cinema outing in Gambia and the United Kingdom, hit Nigeria cinemas on 6 July. The movie which was shot in many parts of England tells the story of a young medical student (Susan) who came to the UK to study with her sister, Maggie (Chioma Chukwuka). She never, in her wildest imagination, believed she could ever fall in love with a white man, until she is introduced to a dashing young Guy (Dermot) by her sister’s boyfriend, Kachi (John Dumelo). But the heart is not so smart; they met and began what became a sizzling romantic relationship, until the events of the past came calling. I love dis movie! It’s intresting wow!